ABCs of School Fire Protection – The best way to ensure school fire safety is to combine active and passive fire protection systems. Active fire safety includes sprinklers and evacuation plans. Passive fire protection involves choosing fire resistant materials that protect people and property 24/7. Stop, drop and roll is a directive learned by thousands of school children. It was the 1958 fire at Chicago Our Lady of the Angels elementary school killing 87 children and three nuns that caused Americans to get serious about fire prevention and safety in schools. Thanks to code changes and fire-safety education launched in the 1960s, the number of fatalities from campus fires has dropped significantly. Still, school fires persist. K-12 school officials place nearly 15,000 calls a year for help in battling campus fires. While fatalities are rare, the rate of injuries from school fires is higher than in either homes or in non-residential structure fires. School property damage is estimated at over $100 million a year. The next step in limiting injury and damage caused by school fires is to adopt a balanced fire protection approach that combines active and passive fire protection systems. Most people are aware of active fire protection measures, like fire alarms, sprinklers, and fire extinguishers that help detect and suppress fires. What many people do not realize is that often invisible, passive fire protection measures deserve a lot of credit for containing dangerous heat, smoke and flames, which is critical to safe egress. For decades, the focus of fire safety has been on active fire-protection measures. These active measures must be installed and maintained in compliance with NFPA 101, NFPA 1 and the ICC Fire Codes. Unfortunately, active systems can fail due to poor maintenance, sabotage or natural disaster. In a 2009 Campus Safety Magazine survey, campus officials named system maintenance as the biggest fire-protection challenge: 58% of K-12 officials and 53% of university officials cited system maintenance as their number one concern. This is precisely why incorporating passive fire protection measures is so important. Despite its name, passive fire protection is always at work. Passive fire protection refers to the strategic use of fire-resistive materials in building construction and remodeling, examples of which are gypsum, masonry and fire resistive glazing. Up to 25 years ago, architects could only use conventional fire resistive materials like gypsum and masonry in order to meet the 1 and 2 hour wall criteria. With the advent of technologically advanced fire resistive glazing that performs like a transparent wall, they can now incorporate clear vision in their designs while still meeting the fire and safety requirements of the code. These fire resistive building materials create fire barriers, firewalls, fire partitions, fire doors, protective openings and smoke barriers that form compartments, or occupancy separations, that contain flames, heat and gases at the point of origin so that building occupants may exit the building safely. Passive fire protection works 24/7 without mechanical triggers, which makes it reliable and virtually maintenance-free. Perhaps the most important benefit of incorporating passive fire protection is the fact that fire-resistive building materials are the best defense against dangerous radiant heat; invisible electromagnetic waves that travel at the speed of light with little resistance. When these waves strike an object, they are absorbed and their energy is converted to heat. If the object is a combustible material, a fire will start when the materials ignition temperature is reached. Radiant heat is extremely dangerous to building occupants since it can quickly reach a level that causes unbearable pain, followed rapidly by second degree burns, preventing safe egress. While active fire protection measures work to extinguish smoke and flames, they do little to protect people and property from dangerous radiant heat transmission, which poses a serious threat to both life safety and the spread of fire. 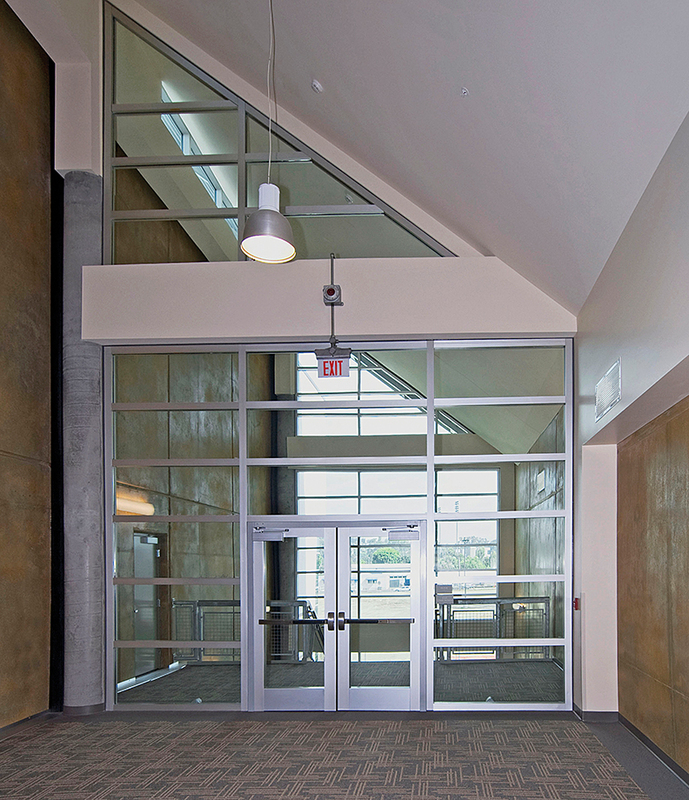 By using fire-resistive building materials such as fire-resistive glazing to create occupancy separations protecting people and property from radiant heat, school corridors remain safe for egress and the structural integrity of school buildings is preserved. School officials can best ensure that campus fires are quickly detected, suppressed, contained, and that people can safely leave a burning building by focusing on both active and passive fire protection measures.